This agreement is used by a model/subject (or the parent/guardian, if the subject is a child) to consent to the use of their image and/or sound in photographic, motion picture, or audio recordings. Furthermore, the agreement specifies the theme, location, schedule, and use of the recordings. Are you filling out this consent on behalf of a child in your care? Do you wish to list this person's company? Examples of themes could be glamour modelling, promotion of a product, travel photos, filming of a commercial, art exhibition, etc. Examples of locations could be 123 Oak St., Ridgewood Elementary School, downtown Toronto, etc. Examples: 11:00am on June 1st, 2019, July 14th-30th, 2019, December 2019, etc. What is the approximate date(s) of the photography/recordings? Do you wish to add other details or conditions? You can leave these fields blank if you do not know the date. We strongly recommend obtaining an attorney reviewed Photo/Video Consent Agreement directly from us. Below are some random samples we have created with Documatica. Please note that these documents reflect a certain set of answers, and it is very likely that the document you require is different. 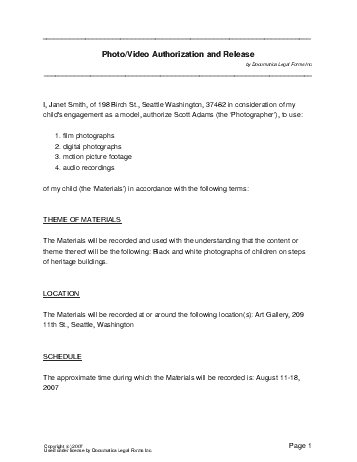 Do not rely on the templates below - create your own customized Photo/Video Consent Agreement with our webpage. For maximum legal protection, obtain a lawyer reviewed Photo/Video Consent Agreement directly from us.